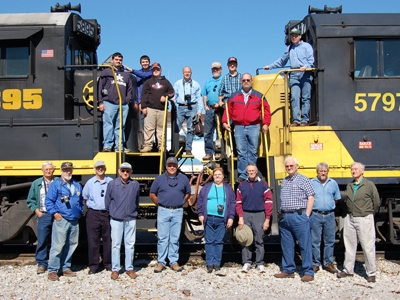 The Bluegrass Railroad Club was founded in 1972 in Lexington, Kentucky to bring railroad enthusiasts together. Our membership consists of people of all ages, backgrounds and interests in railfanning, modeling and collecting. Our modeling members are involved in scales from Z to inch-and-a-half. The Club holds a general meeting the second Friday of each month at the Meadowthrope Community Center. Our meetings consist of a short business meeting followed by a program on many different topics of railroading - past programs have included how to build model trees, DCC operations, maintaining your model trains for operation and railfanning trips. We also have special guest speakers occasionally to speak to the club on railroad operations including Norfolk Southern, RJ Corman, Taiwan high-speed rail, Chinese high-speed rail and local proponents of passenger rail. When available, we take field trips to visit active rail yards, live steam layouts and tours of members' layouts. The club provides a newsletter each month. The current newsletter can be found at the link above. The BGRRC is active in supporting the Boy Scouts of America, local festivals and Southern Lights. Please see the links above for more information on these. Becoming a member of the Bluegrass Railroad Club is simple and low-cost, just visit our contact-us page and request an application.